After the overwhelming response for the first song Adiga Adiga, makers of Natural Star Nani’s next film Ninnu Kori releasing the teaser today, at 10 AM. The film is directed by debutant Shiva Nirvava and produced D.V.V. Danayya is bankrolling this project under DVV Entertainments banner. The film features Nani, Niveda Thomas and Aadhi Pinisetty in lead roles. The film also stars Tanikella Bharani, Murali Sharma, Prudhvi, Rajasree Nayar, Neetu and Bhupal Raj will be seen in supporting roles. Films music composed by Gopi Sunder. This was Nani’s third collaboration with Gopi Sunder after Bale Bale Magadivoy and Majnu while Prawin Pudi and Karthik Ghattamaneni are the editor and cinematographer of this movie respectively. Now, the 41-second teaser showcased the Nani, Niveda Thomas and Aadhi Pinisetty travelling in the car. Nani excels once again with an interesting Cache dialogue “Ammaiyulu anni alavatlu unnodini premistharu.. ye alavatlu lenodini pelli cheskuntaru”. 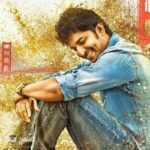 The Teaser Shot in some beautiful locations USA, the teaser of Ninnu Kori Film is one more impressive romantic entertainer from Nani. Recently the makers released the first single Adiga Adiga which received superb responses by the music lovers.This style of offbeat singing became many a Tamil director’s choice in the last decade. Since Gopi Sunder is the one at the helm, he has brought back the genre. As long as it doesn’t seem affected or offbeat for the sake of it, it’s fine.Srijo’s lyrics abound in both straightforward meaning as well as profundity. Thanks to the music director’s soft tunes and understated composition, the lyrics are properly elevated.It has generated much hype as well as created curiosity among the audience. According to sources, the makers of the film are currently busy with the post-production formalities. The film is slated to released 9th July, 2017.